The Google Nexus 7 / Asus Nexus is tablet that supported by Quad core processor and lots of RAM. This tablet has physical dimensions of 7.81 x 4.72 x 0.41 with weighing of 11.99 oz. It has display screen of 7.00 inches with Corning Gorilla Glass protection. More detail about Google Nexus 7 specifications you can read here. The Google Nexus 7 available two alternative storage that is 8 GB and 16 GB. For Google Nexus 7 16GB MSRP price at $ 249 while for 8 GB at $ 199. 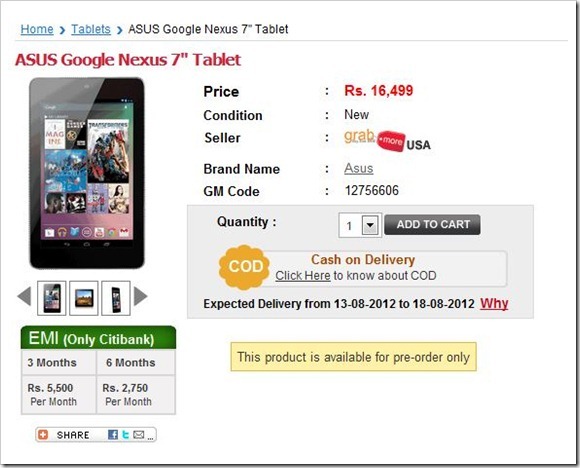 How about price of Google Nexus 7 in India? the price at Rs. 16,499/ (Pre-Order only) and you can visit at grabmore.in.